Who does not want a uniform green lawn, like the meadows, that fittingly complements your house? However, given the rate at which the grass blades grows, among all lawn care practices, mowing proves to be a major factor for keeping lawn well and cultivated. Mowing, contrary to the common notion, has a significant influence on lawn quality and potential problems. Mowing is like a hair cut for your lawn, and we know how it is done; from the years of experience in lawn care and mowing, we have learned what it takes for a great looking lawn. 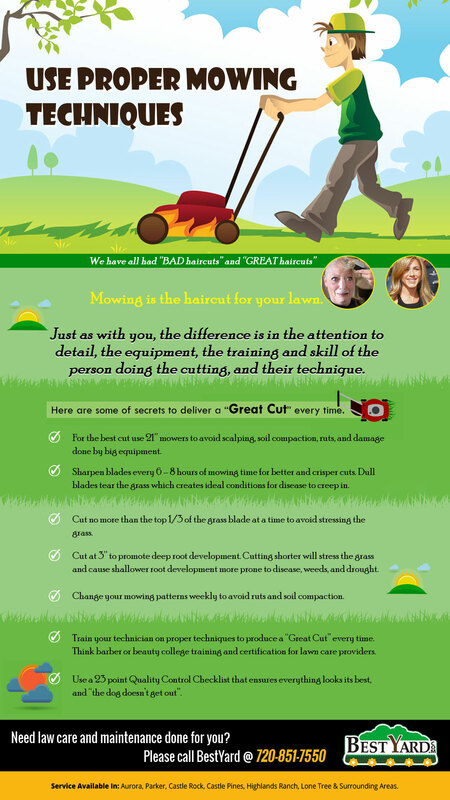 In the following Infographic, created by BestYard.com, we are sharing some of our insight for giving a great cut to your lawn. Learn what are the best equipment, when to change the mowing pattern and how much to cut, and other important things about mowing.